The Florida sunshine means that you can enjoy your swimming pool year round. But even in the warm tropical climate, the swimming pool water temperature can be too cool for swimming in the winter months. Keeping your home or community pool heater in good working order is the best way for your friends and family to enjoy your pool in all seasons. 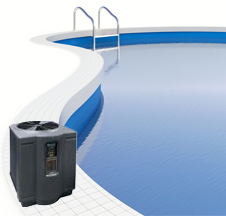 Eco Pro Air provides electric pool heater repair so that the water is the ideal temperature at any time of year. Our technicians have over 22 years experience in heating and cooling services and repair including pool heater service. Your spa or hot tub may also require periodic maintenance and repair to keep the temperatures warm enough for cool Florida evenings. If your current pool heater is beyond repair or out of date, our technicians can make recommendations for a newer, energy efficient model. Electric pool heaters offer high efficiency, power, and reliability while being more environmentally friendly and less expensive than gas pool heaters. We install pool heaters and heat pumps from the top manufacturers including Gulf Stream, Hayward, Raypack, Pentair, Waterco, Hydroroyal and Zodiac.